We are now involved in wars in TWENTY THREE sovereign nations: Afghanistan, Algeria, Burkina Faso, Central African Republic, Chad, Democratic Republic of the Congo, Djibouti, Ethiopia, Gaza, Gulf of Guinea, Iraq, Liberia, Libya, Mali, Nigeria, Pakistan, Somalia, South Sudan, Syria, Tunesia, Uganda, West Bank, & Yemen. Most of these extra-constitutional wars are violations of US Law, International Law and abrogate US Treaties. 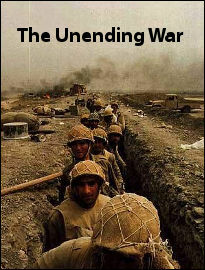 Most were also entered into in violation of the War Powers Act and pose no threat. Each of these wars creates new enemies. While families across the country indulge on their Thanskgiving Day feasts, hundreds will gather at Cole’s Hill in Plymouth on Thursday to commemorate a different tradition: the National Day of Mourning. American Indians and their supporters marched around Cole’s Hill in Plymouth, during the 35th National Day of Mourning on Nov. 25, 2004, after they gathered by the statue of Massasoit on the hill to speak about the conditions faced by indigenous people throughout the Americas. 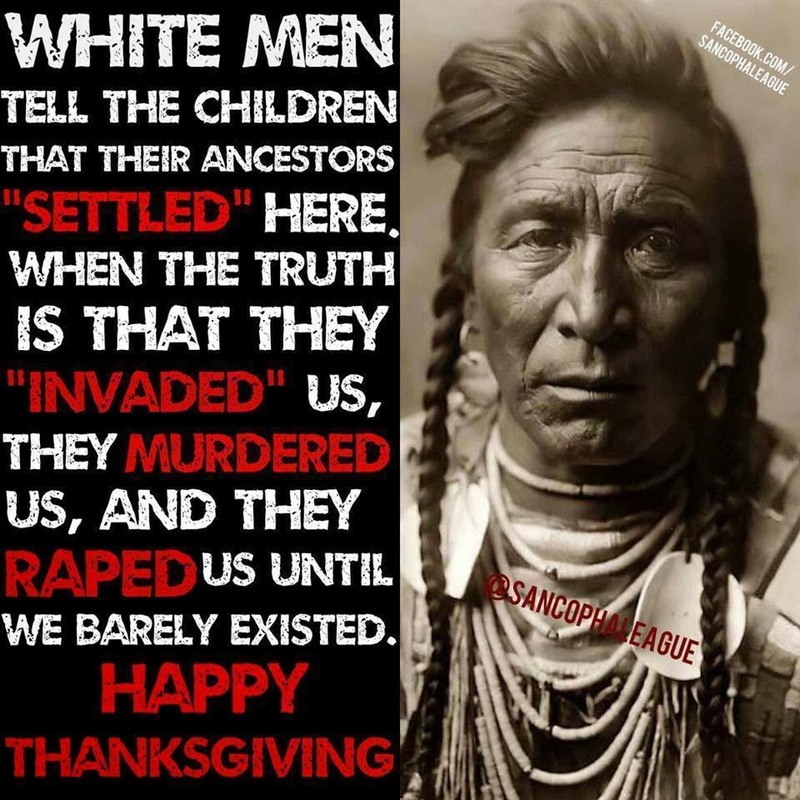 As a holiday, Thanksgiving began in 1637 when it was proclaimed by governor John Winthrop of the Massachusetts Bay Colony to celebrate the safe return of the men who had gone to fight against the Pequot in Mystic, Conn. The fighting led to the enslavement and massacre of over 700 men, women, and children from the New England-based tribe, a bloody precursor to what would be centuries of strife for native peoples in the U.S. In 1970, Wampanoag leader Wamsutta Frank James hoped to speak about this overlooked aspect of history when he was invited to give a speech at a banquet celebrating the 350th anniversary of the landing of the Pilgrims. After reading a draft of his talking points, the dinner’s organizers decided to cancel Wamsutta’s appearance, which prompted him to start the National Day of Mourning. Rather than dwell on the sins of the past, the UAINE hopes the National Day of Mourning brings more awarness to the problems facing Native Americans today. For instance, 28 percent of American Indians and Alaska Natives live in poverty, according to the U.S. Department of Health and Human Services’s Office of Minority Health. The National Congress of American Indians Policy Research found that 32.4 percent of the Native American population under the age of 18 also lives in poverty. According to the the National Court Appointed Special Advocate Association, the mortality rate for American Indian children between the ages of 1 and 14 has increased by 15 percent since 2000, despite the average rate in the U.S. having dropped by 9 percent during the same time period. Of course, there’s also the inherent racism that still plagues American Indians. While they aren’t playing on Thanksgiving, the Washington football team with its deplorable logo still refuses to change its name, to the chagrin of many native peoples, including Moonanum. Pastela, a Native American elder, danced in the Town Square during the 30th annual National Day of Mourning observance in Plymouth on Nov. 25, 1999. Despite the serious issues at hand, the National Day of Mourning does seem to speak to what Thanksgiving should be about, which is bringing people of different faiths and backgrounds together. The event includes activities such as traditional dances as well as a pot-luck dinner, all of which is organized by volunteers. Munro says that the event brings in people from the “four directions,” including native and indigenous peoples from across the country and the world, as well as non-native allies.